We provide these animals with emergency shelter, necessary veterinary care, and identification for reuniting animals with their owners. All volunteers have completed disaster preparedness training provided by YSDADA and other organizations. YSDADA depends solely on volunteers to carry out our programs. We offer all training for emergency shelter operations for free to our volunteers. Once you are trained, we ask that you be ready to respond if needed to a disaster situation. In addition to training, we also conduct periodic drills to make sure we exercise our skills. Persons who don’t wish to help with animal sheltering can help us with non-emergency administrative tasks. 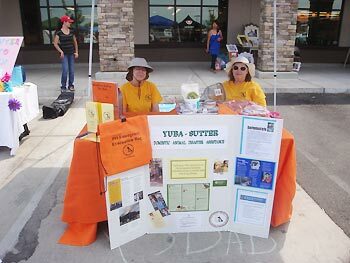 Some of these duties are performed at our office in Yuba City and others can be done from home. You decide what works for you. Applications can be emailed to volunteer@ysdada.org or mailed to P.O. Box 3563, Yuba City 95992. If you have any questions about volunteer opportunities, give us a call at 441-9550.